Unnata Yoga has been featured on the cover on Yoga & Ayurveda Magazine, an online magazine based in Madrid, Spain! In an extensive interview, founder Michelle Dortignac answers questions about the origins, benefits, and differences of Unnata Aerial Yoga. You can see/read the entire Yoga & Ayurveda article here (in spanish). Or scroll down to read the interview in english. What is Unnata Aerial Yoga? Unnata Aerial Yoga combines a traditional Hatha Yoga class with the use of a Yoga hammock prop to assist students with elongation of the spine and proper alignment so that they can find Yoga. There are other styles like antigravity yoga, aerial yoga, yoga swim… that uses hammock; What is the difference between, these yoga styles and Unnata? I am not familiar with all the styles/brands that use a Yoga hammock, so I can only make a very general observation: Unnata Aerial Yoga enhances a traditional Hatha Yoga class, but does not attempt to replace it. Many of the movements and/or exercises of Unnata Aerial Yoga continuously reinforce deep breathing and the stilling of the mind that allows for Yoga to arise. You said that many postures are designed to help student better understand the purpose of traditional yoga postures. How many different postures can we practice with the hammock? All Unnata Yoga teachers and I are constantly uncovering different ways to use the hammock, and different positions to practice with the hammock. It is difficult to put a number on it, just like it would be difficult to put a number on how many Yoga Asanas one can practice on the floor. Of course, many floor Asanas are variations of another Asana, and that is the same for positions in the Aerial Yoga hammock. Unnata combines floor and hammock How is a session? Like many traditional Yoga classes, we start with centering the student’s minds either through breathing techniques, or chanting OM, or concentration exercises. From there we will have a warm-up for the body that continues the connection of movement to the breath. The warm-up may be entirely on the floor (like Surya Namaskar, for example), or it may involve using the hammock to rest part of the body, such as the arms, or a leg, or the upper body, etc. There are certain locations on the body where a student can place a gathered hammock in order to hold all of the student’s weight. When in these types of Aerial Yoga positions, the student can feel quite intense sensations and powerful adjustments to their alignment. We therefore want to balance the intensity of those fully-hanging Aerial Asanas with floor Asanas and with Asanas that use the hammock to lift only some of the body weight off the floor. Tell me about teachers work How a teacher guides a Unnata yoga class? Teachers guide students through a warm-up and various fully-hanging Aerial Asanas meant to elongate and adjust the spine. Both before and after these fully-hanging Asanas, teachers instruct floor Asanas and/or partially hanging Aerial Asanas in order to prepare the body and to help the body continue to release into all the various ways limbs and the spine can move. As in traditional Yoga classes, we end with the Savasana (Corpse Pose) so that the body can assimilate all the energy movement from the class. What is the first thing we must learn to start using the hammock? A student must learn to soften their muscles wherever the hammock holds them, and also they must learn how to release tension all over the body. This is not so easy, as many students hold tension chronically, meaning they are unaware of when and where they hold tension. Tell us about the breathing Which type of breathing is used in the practice? Breathing is synchronized with the movement? Many times, breathing is synchronized with movement in Unnata Yoga classes. Many times, however, positions are held for several breaths, so during those times, deep, diaphragmatic breathing is used. Frequently, the first part of an Unnata Yoga class focuses on expanding the rib cage and lung capacity for taking in breath, then the rest of the class focuses on keeping the belly released while breathing to allow for maximum Prana flow. A better understanding of what we are trying to accomplish on the floor. For some students, it allows them to go upside-down whereas they may not be able to do so on the floor. For others, backbends are easier. The classes are general or each person follows his own practice? The classes are led by a teacher, and all positions can be adapted to student’s special needs or unique capabilities. How did you decide to create Unnata Aerial yoga? 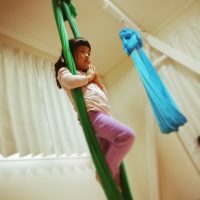 I began training in Aerial Acrobatics as a hobby, and because at the time I had already been a Yoga instructor for several years, I could see from a teacher’s point of view the possibility of using the hammock apparatus as a tool to help students better understand Yoga. I was also aware of the Yoga rope wall from the Iyengar tradition, so it did not seem like such a revolutionary idea to use a hammock in a similar manner as the way the rope wall gets used. To access teacher training course you need to be a certified yoga teacher why? How many Unnata Aerial yoga teacher are there actually? People need in-depth study and years of experience with both practice and teaching in order to teach Yoga effectively. The Unnata Aerial Yoga Teacher Training course at this time is quite brief – only a week long. That is not enough time to educate/train people from the very beginning. Instead, the course gives instruction on how to incorporate use of an Aerial Yoga hammock into a Yoga class. I have trained teachers from many different Yoga techniques. Rather than having them learn an entire new technique, they can learn how to use a prop to enhance their skills and understanding of how to find Yoga. There are currently between 100-150 Unnata Aerial Yoga teachers around the world. What sensations are experienced to be suspended in the air? Many students feel lighter, and more relaxed. Sometimes, the position is not so comfortable, but it is difficult to explain how it feels exactly. Besides the physical postures What other aspects of yoga integrates Unnata? Breath awareness and mental focus. In the teacher training course, we discuss extensively the effects of the Aerial Asanas on the energy body (Pranamaya Kosha). We also discuss the teacher’s role with regards to our own Yoga practice as outlined through the Yoga Sutras of Patanjali. 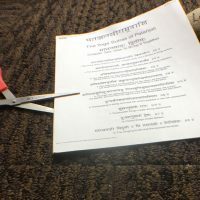 Unnata Yoga teachers may not give instruction on Patanjali’s Yoga Sutras during their classes, but they study and practice the text for themselves. And, the students will benefit from that study, even if they are unaware of the Yoga Sutras. What are the difficulties of practicing on a hammock? Sometimes a student can feel dizzy or nauseous after using the hammock. This is the main difficulty of practicing with a hammock at first. But, the body adjusts with practice. Usually within a week or two, the body has adjusted, and the student no longer feels discomfort. How do you remember the Unnata Aerial Yoga creation process, what is Unnata for you? Unnata Aerial Yoga has slowly evolved, and it continues to transform and develop as I and the other teachers learn how deeply and in what ways working with the Yoga hammock affects the practitioner. For me, Yoga is not about getting the body into a particular condition, but rather it is a process of healing trauma both big and small, all of which affects a person’s outlook on Life and how they interact with others. I have found using the Aerial Yoga hammock (in the ways that I instruct) to have made a profound difference for myself, so I therefore wish to share that information with other Yogis because it may also be helpful for them. What would you say to a person who first try this yoga style? The technique is not so difficult, it does not require a lot of strength, flexibility, or bravery. Why did you decided to work with a hammock? When using a hammock, backbends are more comfortable, the shoulder joint gets conditioned in a way that makes it more stable (preventing certain common Yoga injuries), and core strengthening is developed without causing strain to the back and without interrupting proper breathing mechanics. I felt it would be beneficial to students for all of the above reasons. Unnata includes traditional yoga postures and others, created from the creativity of each person; Why? Some Yoga traditions work on balancing chakra energy from the bottom of the spine to the top, and others do it from the top to the bottom. Some Yoga traditions put twists in after backbending, some would never put twists in after backbending. Some Yoga traditions put headstand before shoulderstand, some switch that order. Because the sequencing of Asanas can vary greatly between Yoga traditions, and I wanted Unnata Aerial Yoga to be accessible to teachers of all styles of Yoga, I felt it was important to allow teachers to use the hammock in the ways that make the most sense to teachers based on their own expertise. Therefore, in Unnata Aerial Yoga, we do have some Aerial Asanas that are the foundation of the practice, and a general outline for sequencing, but then teachers can expand on those basics using their own creativity. People with heart problems or high blood pressure, can practice Unnata Aerial Yoga? I would recommend the same restrictions to people who practice traditional Yoga – no inversions. And, I would give an alternative position for the student so that they can keep themselves in the flow of the class. If I’m not in a mistake, two years ago you were in Ciudad Real (Spain) in a teacher training course How do you remember your experience in our country? Are you planning to visit Spain soon? I very much enjoyed my experience in Ciudad Real. It was the first teacher training program that I led in Europe. We actually did not have many Spanish students, even though the training was full. This meant all the students were meeting other Yoga teachers from different countries, and we could all swap ideas and philosophies. Everyone enjoyed their experience.